In this section, we shall learn how to write a simple test plan to test Java Messaging Service (JMS). 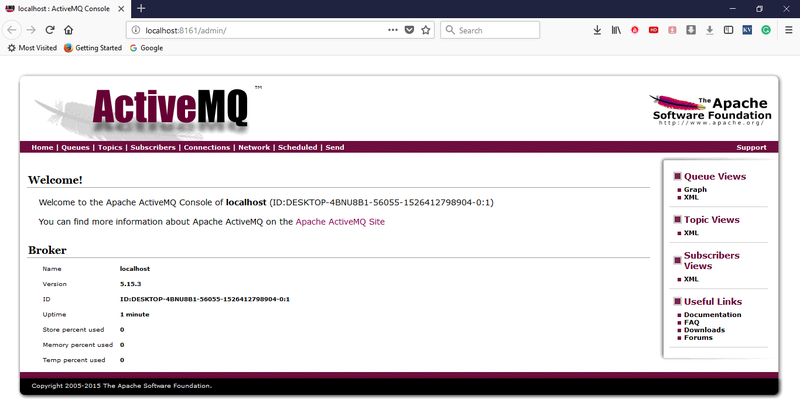 For our test purpose we are using Apache ActiveMQ.There are various JMS servers like glassfish3, IBM WebSphere MQ (formerly MQSeries), Tibco, etc. You can also refer our JMS tutorial to learn more about JMS and its components. Before proceeding with this section, follow these simple steps to install Apache ActiveMQ on your system. Unpack the archive at a convenient directory. In our case it is "C:\apache-activemq-5.15.3". This address will redirect you to its authentication page where it requires User Name and Password. Enter the User Name and password as admin. The following image shows the default interface of ActiveMQ server. Now, copy the activemq-all-5.15.3.jar file from the ActiveMQ unzipped directory toC:\JMeter\apache-jmeter-4.0\lib folder.